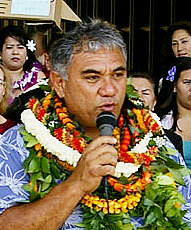 » William Aila Jr., 48, announced his candidacy on Monday for the Democratic nomination for governor. A photo of William Aila Sr. was incorrectly run with a Page A4 story in yesterday's morning edition. The correct photo appears here. » District Judge James Dannenberg sentenced Michelle Rodriguez of the TV show "Lost" to five days in jail. His last name was misspelled as Dannenburg in some of yesterday's editions.